Afghanistan's civilians continue to die in record numbers, according to a new report released Wednesday by the United Nations Assistance Mission in Afghanistan. From the start of the year to the end of September, the U.N. documented 8,050 civilian casualties, of which 2,798 died, and 5,252 were wounded. In the 17 years of conflict, the last five years seem to have been the deadliest for civilians, a chart in UNAMA's report indicates. Most of the casualties resulted from the actions by non-state actors, including the Taliban and Islamic State. The use of improvised explosive devices used in suicide attacks increased in their "frequency and lethality," according to the U.N.'s Quarterly Report on the Protection of Civilians in Armed Conflict. "Of the 65 percent of civilian casualties attributed to anti-government elements, 35 percent were attributed to the Taliban; 25 percent to Daesh/ISKP; and 5 percent to unidentified anti-government elements (including less than 1 percent to self-proclaimed Daesh/ISKP)," the U.N. report specified. The second leading cause for civilian casualties, 29 percent, was ground engagements between warring factions. 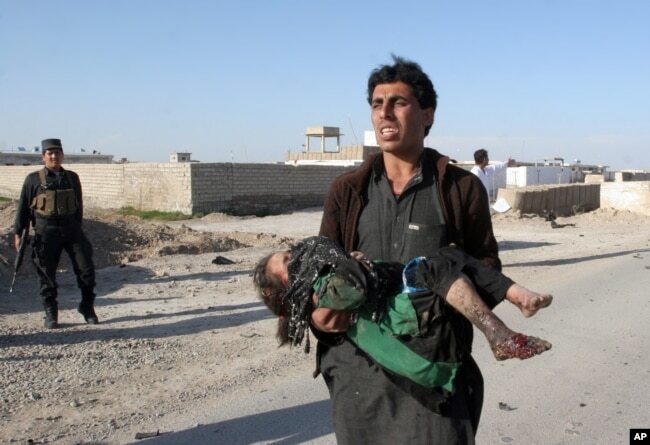 FILE - An Afghan man carries a wounded girl at the side of a suicide attack that killed civilians and a policeman in Lashkar Gah, the capital of Helmand province, south of Kabul, Afghanistan, March 16, 2015. The report said casualties from ground engagements have declined, which may be due to efforts by various parties to protect civilians from harm, like advance warnings. The province with the most casualties was Nangarhar, where ISKP, Islamic State's Afghan branch, still has a stronghold. It was also the deadliest province for U.S. forces in 2017. The increase in NATO and U.S. airstrikes on Taliban and ISKP targets, particularly since President Donald Trump announced a new South Asia policy in August of last year, led to an increase in civilian casualties from air operations, the report said. The U.N. called the trend "worrying." More than 60 percent of the civilian victims of air attacks continued to be women and children, with the number of child victims increasing 53 percent over the same period last year, according to the report. Many attacks were on anti-government elements hiding among the civilian population, the report said. UNAMA has recommended to both Afghan and international forces that they review their targeting and battlefield criteria, including "considering all persons to be civilians unless determined otherwise." Reports of human rights abuses during government search operations is another concern of the U.N. mission. "The mission received consistent, credible accounts of intentional destruction of civilian property, illegal detention, and other abuses carried out by NDS Special Forces and pro-government armed groups, including the Khost Protection Force," the UNAMA report said. The report also documented the "killing, maiming, sexual abuse and recruitment and use of Afghan girls and boys." Meanwhile, 366 civilian casualties were a result of election-related violence. Afghanistan plans to hold its parliamentary election on Oct. 20. Calling the upcoming election "bogus," the Taliban announced this week that it would use all means to disrupt the elections, giving rise to fears that election-related violence will increase in the next two weeks. "The Islamic Emirate instructs all its Mujahideen to halt this American-led process throughout the country by creating severe obstacles for it, while taking extensive and intensive care of civilian Afghan lives and their properties," the Taliban statement said, asking fighters to attack anyone involved in helping hold the elections. The U.N. report also pointed out that civilians paid the heaviest toll during several days of fighting in Ghazni city when the Taliban launched a multipronged attack in August. "All parties can and should do their utmost to protect civilians from harm," said Tadamichi Yamamoto, the secretary-general's special representative for Afghanistan and head of UNAMA. (CNN) - The number of civilians -- mostly women and children -- killed or injured by airstrikes in Afghanistan has risen a startling 39% year on year, according to UN figures released Wednesday, casting fresh scrutiny on the use of air power by the United States and its Afghan partners at a time of near-record bombing and increasing violence. More civilians have been killed or injured in airstrikes so far this year than all of last, according to a United Nations quarterly assessment of civilian casualties. The rise comes after the departed US commander for the war promised a "tidal wave of air power" to combat a resurgent Taliban. US President Donald Trump has personally delineated a strategy for victory in Afghanistan, and vowed to "push onward to victory with power in our hearts." The UN report comes as the US ratchets up its involvement in what has become the country's longest-running war. The US has boosted its support for the Afghan Air Force through training and weapons supply, raising concern over the air force's use of US-supplied non-guided bombs that have taken a clear toll on civilian lives. The UN report shows airstrikes, carried out by both US and Afghan aircraft, have killed or injured 649 civilians so far this year, 39% higher than the same first nine months in 2017, and more than the 631 killed or injured by airstrikes in all of last year. Sixty percent of this year's casualties have been women and children, according to the report. The report also says that total civilian deaths across Afghanistan -- due to various violent attacks -- stands at 2,798 for the first nine months of this year, slightly up on the same period in 2017. US and Afghan aircraft are almost equally responsibility for the casualties, according to the report. US figures show its aircraft released a near-record number of bombs in July. They carried out the most airstrikes in one month since 2010, when the US had about eight times as many troops in the country, requiring constant air support at the height of the Obama administration's surge there. According to the UN report, anti-government elements are still responsible for the vast majority of civilian deaths and injuries, accounting for 65% of casualties overall so far this year. The huge increase in bombing, however, relative to the 14,000 US troops now in country, will spark questions as to whether US forces have been given looser rules of engagement, in a conflict that has now run for 17 years. In a wide-ranging speech on Afghanistan in August of last year, Trump said he had loosened "restrictions the previous administration placed on our warfighters," yet the exact nature of the new rules hasn't been made public. In response to the report, US Forces Afghanistan spokesman Cmdr. Grant Neeley reiterated that anti-government elements were the main cause of civilian casualties. "Indiscriminate targeting of innocent civilians through improvised explosive devices and deliberate suicide attacks has increased in both frequency and lethality. These actions expose the hypocrisy of Taliban who espouse a high regard for this country and its people while creating an environment of death and insecurity." While the varied use of US air power has at times put civilian life in greater danger, the scale and manner of the airstrikes undertaken by the Afghan Air Force is both relatively new and startling. Figures given to CNN by the Afghan Ministry of Defense show more than 800 airstrikes since the end of June were carried out by the Afghan Air Force, a body of light aircraft and pilots trained and equipped over the past two years by the US. The Pentagon has asked Congress for $1.8 billion to train and equip the AAF in 2019. The figures show thousands of insurgent deaths reported in under four months. Such official Afghan figures are often considered inflated by some experts, and the Afghan Ministry of Defense does not appear to publicly tally civilian casualties. The airstrikes recorded include the use of machine gun fire and bombs by the Afghan Air Force's planes and helicopters, which mostly deploy less accurate, non-guided munitions that are more likely to cause unintended civilian deaths. Mohammad Radmanish, an Afghan Defense Mignistry spokesman, told CNN that the air force "rarely uses" guided bombs in their airstrikes, listing only four provinces in which they had been used, and saying they had no record of the total number deployed. Radmanish said he doesn't accept his country's air force is responsible for civilian casualties. "Whenever there are civilian's casualties, it happens from insurgents' side. Either they plant bombs or they use civilians [as human shields] in their fight," he told CNN. In just the last month, the Afghan Air Force carried out 237 airstrikes, according to the defense ministry, which says it killed more than 1,300 insurgents in the strikes. But the constant toll on civilians by this peak in air power is growing, and has been palpable in the past weeks. 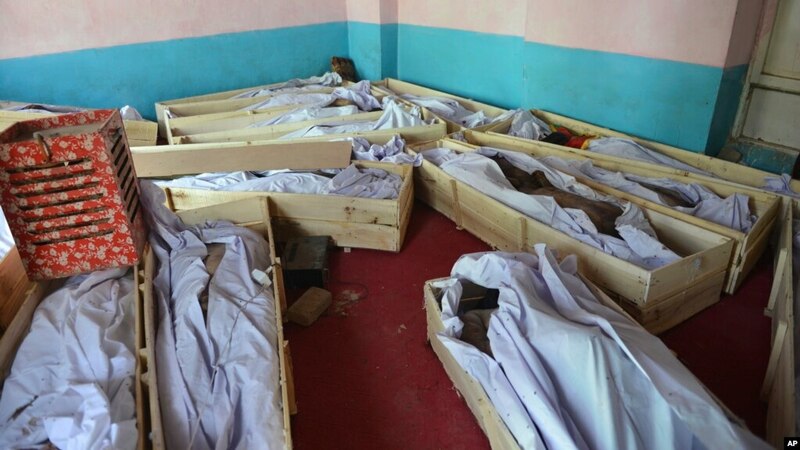 On September 23, 10 civilians, including women and children, were killed when an Afghan airstrike hit a residential house in Jaghato district, in the province of Maidan Wardak, according to Akhtar Mohammad Taheri, head of the provincial council. Another 67 insurgents were killed in the strike. On October 4, according to a statement from the Kandahar government, three women and a child were killed in an apparent Afghan airstrike when insurgents hid in civilian houses in the district of Maroof, after attacking army checkpoints in the villages of Khogyani and Ishaqzai. Eight other civilians were injured, and eight insurgents killed, the statement said. Three women were killed by a US airstrike in Chardara district of Kunduz on September 25, according to Esmatullah Moradi, Kunduz's provincial spokesman, during an operation against the Taliban. The husband and father-in-law of two of the three deceased, in emotional footage obtained by CNN of the victims' bodies stacked in a truck, said: "I collected her body parts in a sack, we lost everything. My wife, my daughter in law were killed, and my son is in the hospital." A spokesman for US forces in Afghanistan disputed any US role in the above cases, and said they had even reopened their investigation into an earlier incident in Kunduz on July 19 this year, after receiving new information, so thorough were their procedures. "We are keenly aware of the continued practice by insurgents to use close proximity of civilians, often by force, to prevent air strikes and counterattacks on their positions," said Col. David Butler, US Forces Afghanistan spokesman. "When these situation are identified in time, our forces respond appropriately by choosing not to attack to protect innocent lives," Butler added. "We're the most precise military in world existence. We train the Afghans to operate by the same standard. Though still in its infancy, the Afghan Air Force continues to grow in size and capability." This story has been updated to reflect that the 39% increase relates to civilians killed or injured by airstrikes. At least 8,050 Afghan civilians were killed or wounded in the first nine months of 2018, almost half of them targeted by suicide bomb attacks and other improvised devices that may amount to war crimes, the United Nations said on Wednesday. The number of casualties was roughly in line with the same period a year earlier, when there were 8,084 casualties, with deaths this year rising five percent to 2,798 and injuries falling three percent to 5,252, the report from the UN Assistance Mission in Afghanistan (UNAMA) said. "As there can be no military solution to the fighting in Afghanistan, the United Nations renews its call for an immediate and peaceful settlement to the conflict," said Tadamichi Yamamoto, the top UN official in Afghanistan. < marginwidth="0" marginheight="0" scrolling="no" border="0" height="350" width="300" id="_mN_dy_652764634" style="-sizing: border-; margin: 0px; padding: 0px;">Seventeen years after U.S. forces led a campaign to overthrow the Taliban following the Sept. 11 attacks on New York and Washington, the figures underline how dire the security situation remains. "UNAMA recalls that attacks deliberately targeting civilians and the murder of civilians are serious violations of international humanitarian law that amount to war crimes," it said in the report. A wave of suicide attacks in the eastern province of Nangarhar and in the capital Kabul this year has hit students preparing for exams, spectators at sporting events, people waiting to register for elections as well as Shi'ite mosques. The mainly Shi'ite Hazara minority has been especially heavily targeted by attacks claimed by the local affiliate of Islamic State. The report attributed 65 percent of casualties to the Taliban, Islamic State and other anti-government forces. As casualties from suicide attacks and improvised explosive devices rose, casualties from ground fighting fell by 18 percent to 2,311 (605 deaths and 1,706 injured). At the same time, there was a 39 percent rise in the number of casualties from air strikes, which have risen as air operations have been ramped up, to 649 (313 deaths and 336 injured).